It’s been a good(ish) month, walking-wise, just haven’t posted anything. Among the good news – pretty sure the worms/caterpillars are gone. Bad news – though it’s not really bad, just annoying, it’s been stinking hot. I think of June as the worm month, not the who-turned-the-thermostat-up-to-cremate month. Lots of temps close to 30C. I’m not a fan, although I own three fans, all of them operating at hurricane strength. Since I haven’t posted, I’ll begin backwards. I fell in love with a tree on Saturday. 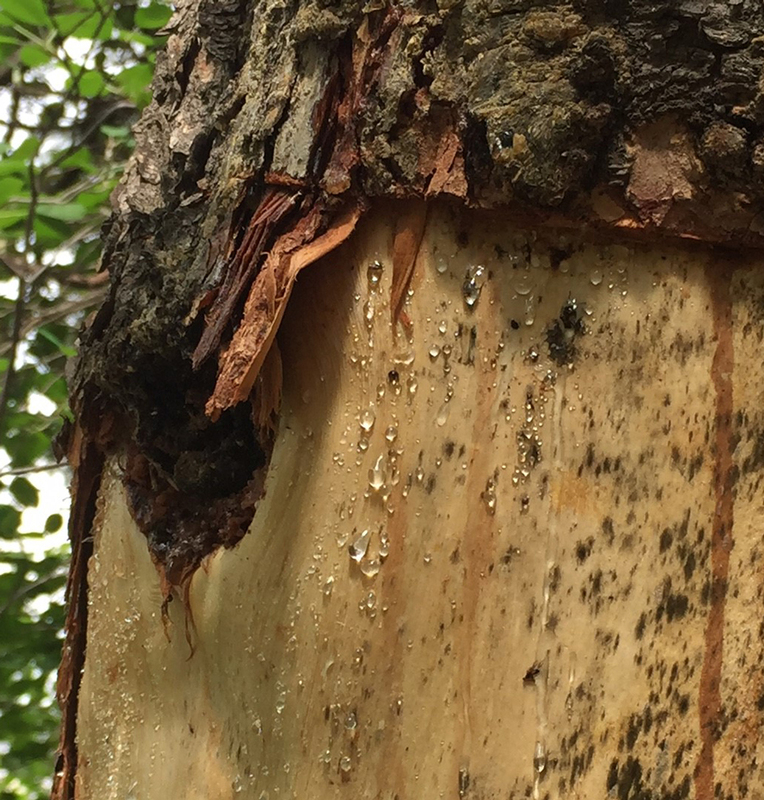 The spruce tree’s bark was gone in one area, exposing its soft underbelly of wood, which was bejeweled with sap. And I mean bejeweled. 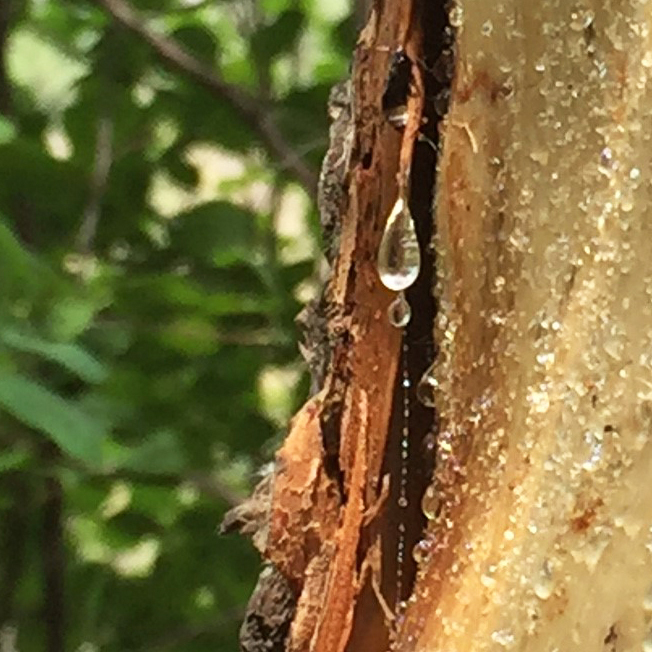 It was bleeding tiny amber gems, and in the dappled sunlight, the sparkle was breathtaking. I was there at exactly the right time for the sun to catch this glorious display. I thought, oh here you are. There’s always something unique that reveals itself on my walks. Something amazing or unusual, or extraordinarily beautiful, like this tree. I tried to capture it on film, but failed. I thanked it, and moved on. 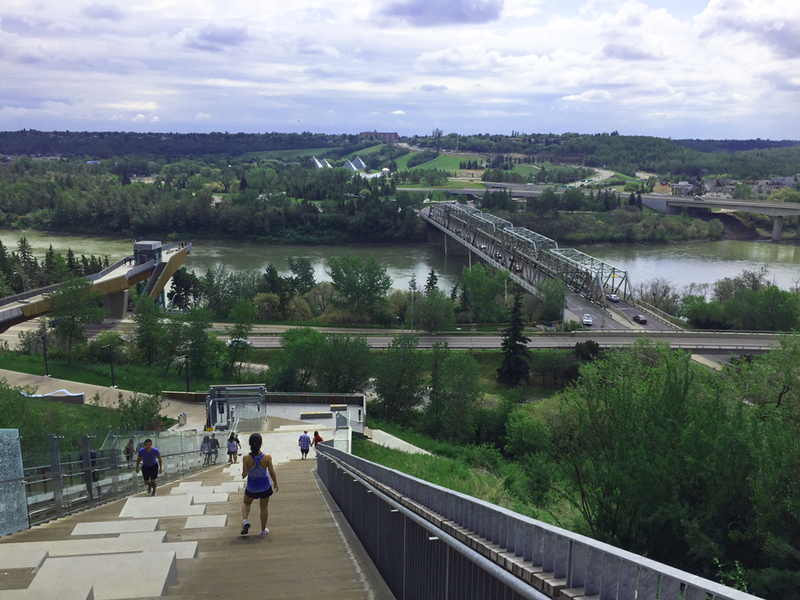 For this particular walk, I took the bus down to 100 Street, and then walked down the new staircase to the Low Level Bridge, and then east to the ski hill and over to Mill Creek Ravine. 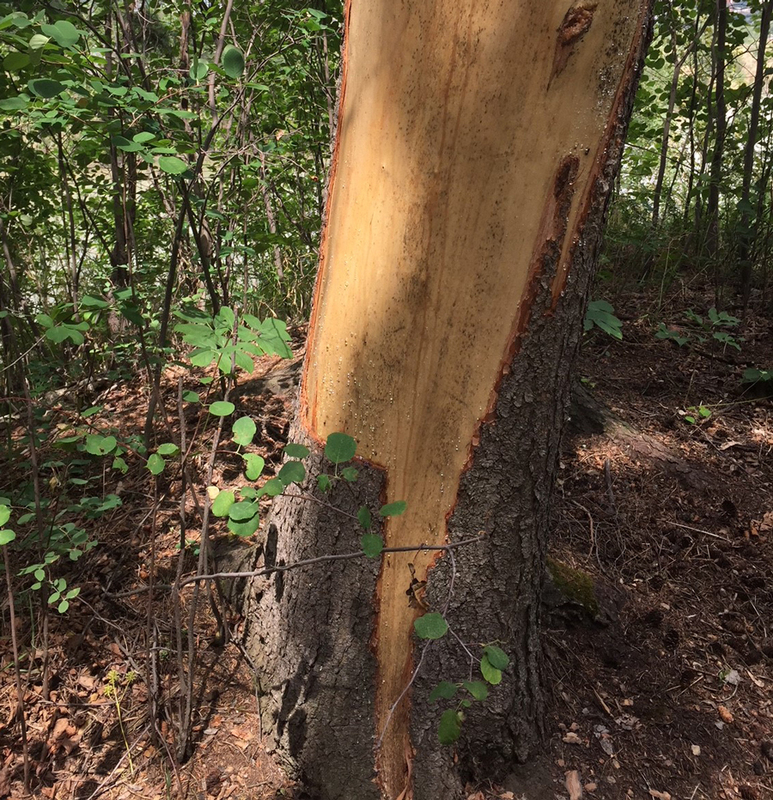 Along the way, I observed many caterpillar damaged trees, but happily, no dangling worms. The trees will come back. The worms, however, have now transformed into some kind of moth. Not nearly as creepy. This grove of trees in Henrietta Muir Park, or what’s left of it, has been severely damaged by the leaf roller caterpillar, but it will return to its green self by mid-July. The river valley is full of these seemingly dead trees, most of them Green Ash. 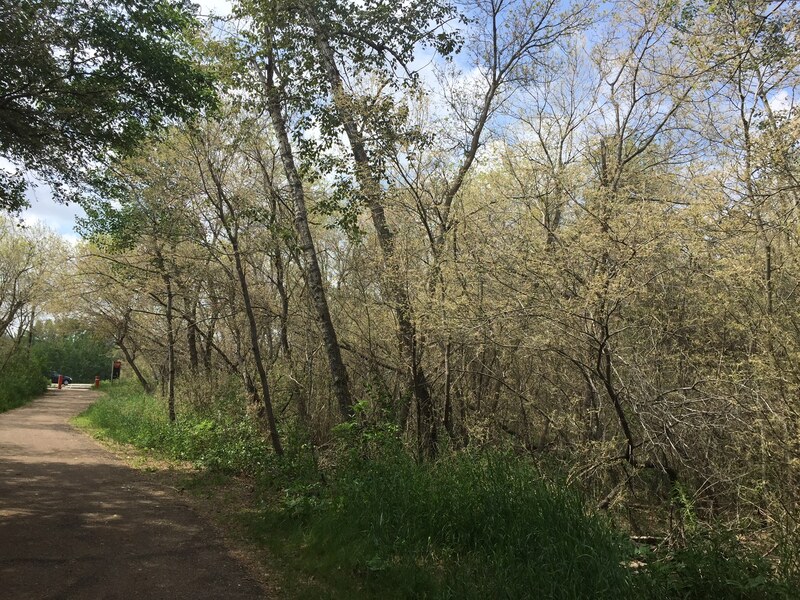 After that, a walk through Skunk Hollow – the trail where I saw the tree (and thousands more), and the beautiful little path that eventually runs parallel to Scona Road. The upper paved part of that trail is now off limits because of severe cracking, but I went beside the gate, as many others have done judging by the well-worn path. I wonder when, or if, the city will fix this? After that, I was so hot and so tired I took the funicular back up to street level. Generally, I don’t count steps or kms, just time, but that day I clocked in at 15,000+ steps (over about two hours in total). Pretty decent. 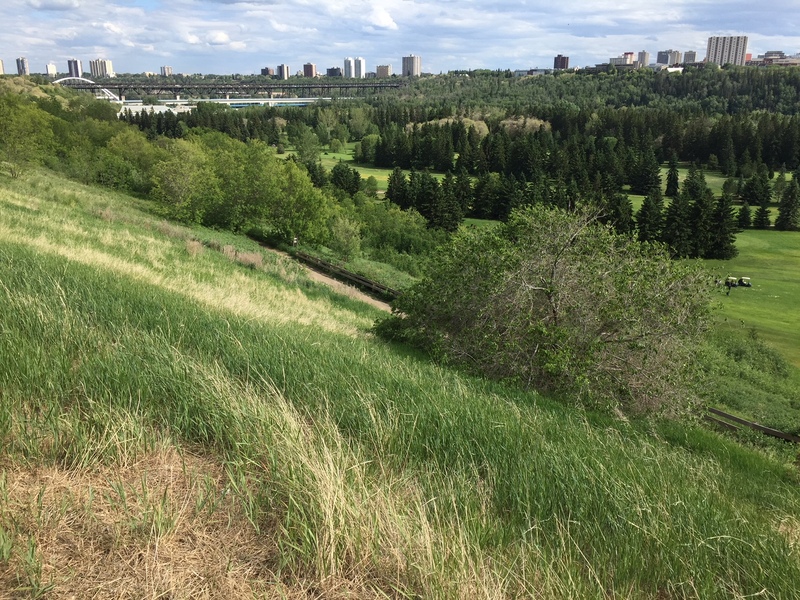 The other walks this June have been around the ‘hood and in Whitemud Ravine with Stella. 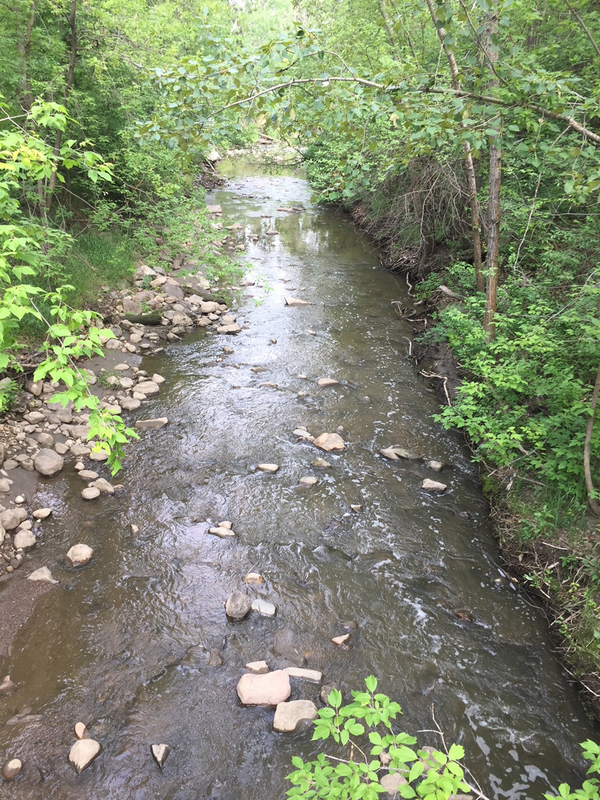 I’ve been trying to avoid the river valley because of the caterpillars, but now that they are gone, I can resume my walks home through the trails.